This was one of the most bizarre missionary biographies I have ever read. It concerns three generations of Morse families who worked among the Lisu tribal people. They were deported from China when Mao Tse Tong conquered China and so they crossed into Burma to continue to work with the Lisu people who lived and moved into Burma. After fifteen years developing a strong church, teaching the Bible, and acting as a village doctor (though he was never trained as a doctor), the Morse Family, now three families (Parents and two children and their own families) were given an order to leave Burma by December 31, 1965 as the military government cracked down on all foreigners living in their country. However, they found they had a deep predicament. They loved the Lisu people and didn’t want to leave them. So, before they could be deported, they escaped in the night to a remote mountainous region on the Indian-Burmese border in which only a few other people lived. During this time, one of the brothers named Robert translated the Bible into one of the languages they were working among. They built villages out of the jungles. They hunted wild animals for food and planted fruit trees and crops. They remained isolated from Burmese authorities from 1965 until 1972! In that time the whole Vietnam War with the US against North Vietnam was birthed, peaked and was nearly ended by 1972 and this Morse family just remained faithful to God’s calling in the remote jungle and ruggedly mountainous region of Burma amongst the Lisu people who they loved. They were completely isolated to the world. As I read the book, I felt as if there were no chapters, but actually as I looked back I noticed it did have chapters. Even though the book is more than 200 pages of small print, I read the book in one sitting. (A long one!) Each section of their journey was paralleled by a simple scripture from Exodus detailing the people of Israel as they wandered in the wilderness and found their way to the Promise Land. 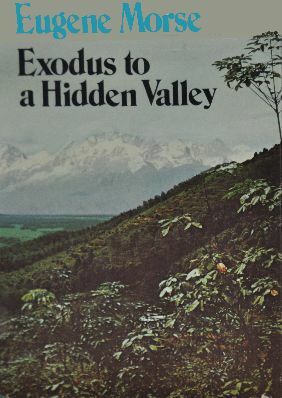 Because the publisher was a secular one (Readers Digest) it was not overtly detailing the spiritual lives of the people, tending to focus more on survival, however, it certainly does not shy away from Christian content speaking even of demonic and miracles which was not so openly discussed among conservative Christians in the1960’s and 1970’s. This is an amazing adventure story. Being from a missionary family just makes it all the more interesting for me. I have almost come to the conclusion that there is no “untouched” area of the world today, but I think the Morse family had one. Even today, that place is still inaccessible. Interestingly, the area where they were is littered with WWII era US cargo plane wrecks. I just recently saw a special on CNN about an American who has been “discovering” these wrecks today. Come to find out in the 1960’s the Lisu tribal people made all of their cooking pans from the aluminum which was scavenged from many crashed airplanes. No doubt there are some sites “undiscovered”, but my guess is most have been thoroughly picked over by the time this modern-day CNN “explorer” showed up. This was a great book to read. Quite an adventure! I would love to meet members of the Morse family one day, my guess is you can find them wherever the Lisu people live!